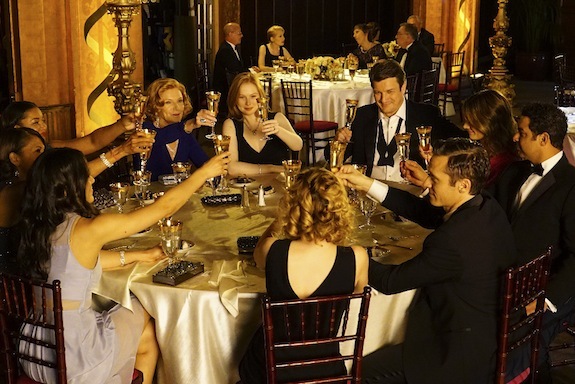 As this season of Castle draws to a close, I wanted to take a moment to thank all of you for coming here to talk about the show with us each week, and also to thank Heather for her wonderful posts about the show when I wasn’t able to write about it. It’s always a pleasure to get to talk about a show I love so much with others who love it like I do. Two-Sentence Summary When a murder victim is found with crosses carved into her face, Castle is reminded of the grim discovery he found in the woods as a boy, which led to his fascination with the stories behind murders. As Castle faces his past demons, Beckett is given a potential new path to follow in the future when it’s suggested she run for New York State Senate. Game-Changing Moment Changes in Beckett’s career have been centerpieces in more than one Castle finale: Her resignation played a big role in the conclusion of Season Four’s finale, and her job offer from Washington was a focal point in the finale of Season Five. And now in Season Seven, we were given Kate Beckett at a career crossroads that has huge implications for the character and Castle as a show no matter which option she chooses. On one hand, she was offered a chance to run for New York State Senate. On the other hand, she was told she could be captain of her own precinct within a year. Both paths would lead to big things for a character who certainly deserves them, but both paths also would most likely take her away from the 12th precinct. Since this episode was written as a potential series finale (as both main actors’ contracts were still being negotiated at the time it was written), those two job offers made sense as new paths for Beckett to take in a future we wouldn’t be watching play out every week. However, it’s going to be interesting to see what the writers do now that both actors are back and the show has been renewed for another season, with the promise of many more coming from executives at ABC. Will Beckett choose one of these paths but still stay involved at the 12th precinct somehow? Will she forgo running for State Senate in order to focus on becoming a captain within the year (thus staying at the precinct and giving the show another season to figure things out)? Whatever she chooses, it has the potential to be a serious game-changer for a show that has such a strong focus on the family that’s been built within the precinct and the relationship between Castle and Beckett as partners in both life and work. Finale M.V.P. “Hollander’s Woods” was a great showcase for the talents of both Stana Katic and Nathan Fillion. However, the real stars of this finale were another successful partnership: writers Andrew Marlowe and Terri Miller. As creators, producers, and writers, this dynamic duo has been the heart and soul of Castle from its earliest days. And with both them exiting the show after this season, this finale was their swan song. And what a lovely song it was. Castle is a show about a writer. Therefore, it’s a show about words. And in Marlowe and Miller’s hands, the words in this finale simply felt right. The plot moved along well and revealed some fascinating stuff about Castle’s character, but the actual lines spoken by Castle and Beckett were the most memorable thing about this excellent finale. Beckett’s speech about taking pride in her work and her marriage could only have been written by a woman who loves this character the way Miller does. The scene in which Castle gave Alexis advice about finding her passion was written with a wonderful understanding of both characters and their relationship. Castle’s acceptance speech made me cry because of the simple beauty of the words he was saying. And every scene between Castle and Beckett was written with real care for capturing the essence of the partnership Marlowe and Miller have been devoted to since Day One. “Hollander’s Woods” was like returning home to Castle at its best after a year that’s had its ups and downs in terms of the show’s writing. It reminded me of the power of the right words spoken by the right characters. And it made me feel very grateful for everything Marlowe and Miller have given to me as a fan over the years. It’s sad to see them leave, but I’m so happy they left with such a graceful and beautiful farewell. What Didn’t Work I said it back when I first saw the writing on the wall about a political future for Beckett: I just don’t see her working in that world happily. I can’t see her running for political office, considering her history with corrupt, morally-bankrupt politicians (Bracken) and with the way her time in Washington ended in Season Six. A political future sounds like a big career step for a woman like Beckett, but it doesn’t seem to fit with what we know of her as a character. However, that’s just my gut feeling about it, and I’m willing to see where this storyline goes should they choose to pursue that line of storytelling next season. I’m just slightly concerned about all of these career paths for Beckett taking her—and the show by default—away from the 12th precinct. Other than my slight misgivings about Beckett’s potential plans for the future, I had no major complaints about this episode. In fact, my only real concern was that it was almost too good. “Hollander’s Woods” was written as a potential series finale, and it felt like one—a great one. It was the kind of high note I wish everyone’s favorite TV shows could end on—one that paid tribute to the show’s past, honored all of the important characters and their relationships with one another, and ended with a beautiful sense of closure. However, “Hollander’s Woods” isn’t the end. There’s still plenty more Castle on its way. And while I would never want to seem ungrateful about getting more of one of my favorite shows on television, there’s a big part of me that wishes the series could have ended with this episode. I honestly don’t know how anyone—especially anyone not named Miller or Marlowe—will be able to top it. I have faith that next season will still have plenty of great moments, but it’s hard not to think that the show might have been better off ending on such a strong episode in the hands of the people who’ve known it better than anyone. This is especially true because the episode ended with such a genuine sense of closure that I’m not sure how the new show-runners will approach anything next season. And that left me feeling torn at the end of the episode instead of simply being able to bask in the wonderful hour of television I had just watched. What Worked If the biggest problem I had with an episode was that it might have been too good, then you know it was a strong one. In fact, “Hollander’s Woods” might have been the strongest episode of this season of Castle. Some of that strength came from its open sentimentality (given its standing as a could-be series finale), but it never felt like it was trying too hard to be nostalgic or sweet. In fact, one of my favorite things about this finale was that it was anything but those two adjectives for the majority of the episode. “Hollander’s Woods” was downright creepy and unsettling for most of the hour, and that kept my adrenaline pumping in a way a Castle finale hasn’t done in a long time. “Hollander’s Woods” took a crucial piece of Castle’s backstory and developed it in a way that not only made perfect sense; it made us care even more about this character that we’ve known for seven years. In that way, it got everything right where “Sleeper” got everything wrong. The pieces of this part of Castle’s history fit together brilliantly; it felt right that he became a mystery writer to deal with the unanswered questions he had about this trauma from his past. It felt right that he would still be haunted by it 30 years later. And it felt right that this was his motivation behind trying to figure out why killers kill, especially ones who kill in disturbing ways. “Hollander’s Woods” answered 3XK’s question from all the way back in Season Three about why Castle has been drawn to death in such a compelling way. And it was so compelling because the combination of strong writing and another great performance from Nathan Fillion. Fillion plays haunted like no one else on television. He made me believe with every look and every deep breath that he’s been carrying a weight around for 30 years that’s starting to crush him again. While Stana Katic has always excelled at playing Beckett’s desire for justice with an impassioned fervor that makes you want to stand up and cheer, Fillion is her perfect counterpart because he goes for quiet, grim determination instead of the big reactions. That was on full display in this episode, and it kept what was already a very dramatic hour from veering into unrealistic melodrama. “Hollander’s Woods” genuinely scared me, and it was supposed to. Maybe it’s just because I have a very intense fear of masks, but I thought the dark tone of the majority of the hour came through perfectly—from the cinematography (which was grittier than usual) to the very disturbing performances turned in by the guest actors. I always like watching episodes where the case has very real and very personal stakes for the main characters, because it always makes me feel more invested than I do in “case of the week” episodes. For as great as the case was and for as exciting as it was to get a piece of Castle’s backstory that actually made me feel something beyond frustration (Sorry, I’m still bitter about Sleeper. ), the biggest strength of “Hollander’s Woods” was its use of all of the characters we’ve come to care about over the last seven seasons. The reason it felt so much like a series finale was because it devoted time to every important relationship that’s made the show special, and it did so in a way that truly honored what the fans have come to love about these characters. I knew this episode was going to be a great one after the scene between Castle and Alexis, because that was probably the best scene between them in years. There was such warmth in that scene, and I love moments when the very real father/daughter dynamic between Fillion and Molly Quinn gets a chance to shine. Alexis is at her best as a character when she’s written like a real young woman who’s sometimes unsure and in need of the advice that can only come from a parent. And I will never stop loving Castle’s words of wisdom to his daughter because they’ve often led to my favorite quotes in the entire series. There was such genuine uncertainty in Alexis in this scene, but it was matched by such steadfast faith from her father that she would find her passion and her place in the world. That moment was a lovely reminder of the beauty of this father/daughter relationship—one of the best of those relationships on television over the last seven seasons. If we’re talking about great scenes in “Hollander’s Woods,” I can’t go any longer without mentioning Beckett’s speech to the men who want her to run for State Senate. Watching them put her down and then degrade her relationship with Castle because of Nikki Heat was painful, but it was one of those moments where the payoff was even better because what came before it was so tough to take. There have been plenty of “badass Beckett moments” in the show’s run so far, but I’m not sure any of them could top what “Hollander’s Woods” gave us. Katic delivered Beckett’s monologue with all the ferocity and pride I would expect from an actor who loves her character as much as she seems to. And each word of that monologue was filled with a respect for Beckett that could only have come from Miller. There was such power in watching this woman stand up to two men who tried to tear down everything about her—from her work to her marriage—and say what amounted to, “You don’t get to define me. Only I get to do that. And I am proud of who I am as a detective, a leader, and a wife.” Beckett has come so far over the course of seven seasons, and it led to that moment of taking ownership of every part of who she is and taking pride in her whole self, which has been something she struggled with for long stretches of the show’s history. Beckett has never been stronger than she was in that moment, and the pride I felt for her was overwhelming to the point of tears. I don’t necessarily want Beckett to run for political office, but if that storyline was the sole reason we got this scene, then I won’t complain about it. In an episode filled with stellar scenes, this was my personal favorite. While Beckett was at her most obviously strong during that monologue, I loved the little moments of quiet strength between her and Castle throughout the episode. I’ll freely admit to crying as soon as we saw the first shot of them on their swing set, but the real tears came as the scene unfolded and we got to watch how far they’ve come from the first time they sat on those swings (and even from the time when Castle proposed to her on them). They’ve both become so much more open—working through a major life decision together in the way couples in strong relationships do. I have always loved the way Castle has supported Beckett’s career and admired her professional abilities from the very start of their relationship, so the way that part of their dynamic was honored in that scene filled me with joy. No matter what, Castle was going to back Beckett’s play, and Beckett did the same for him as the episode drew to a conclusion. Their partnership—in work and in life—has always been the center of this show. So to see it celebrated in big ways (passing the gun under the door) and small ones (Beckett supporting his career as he supported hers) was beautiful. I adored the quiet moment between them before Castle’s big awards ceremony, in which Beckett reminded Castle that they both became who they are not because of dark people but in the face of them. They were both guided to their career paths by tragedy and trauma, but they chose those paths not to dwell on the darkness but to advocate for the justice they felt was missing in the murders that played a formative role in their lives. And those paths ultimately led them to one another. Castle’s acceptance speech at the awards ceremony was a fitting tribute to every wonderful dynamic on the show: his love for his two redheaded pillars of strength; his appreciation for extended family within the 12th precinct; the bond of brotherhood between himself and Ryan and Esposito; and his devotion to his wife. Each one made me emotional, but it wasn’t until he referenced Beckett telling him “You have no idea” in the pilot and followed that up with an “Always” that I went from emotional to ugly sobbing. There’s something truly special about being reminded of the journey you’ve been on with a group of fictional characters as they’ve all grown to become a family, and that’s what this scene was all about. And at the center of that family is the love between Castle and Beckett, which was as evident in the words he spoke and the look on her face as it’s ever been. I loved seeing all of the show’s characters together for the first time ever at the end of this episode, raising their glass to the future as a family—before duty called, of course. I can’t think of a better ending for this group of characters than what we were given. It was warm, hopeful, and filled with the kind of love that makes great finales stand out from the rest. You could feel the sense of family not only between the characters but between the actors as well. As I said, part of me still wishes that final scene was the the final scene for Castle because it felt so right. It was such a fitting way to say goodbye, and I just can’t imagine anything more fulfilling closing the show in the future. But I’m willing to be pleasantly surprised. If this episode taught me anything, it’s that I can always find new episodes of this show to love. Questions to Keep Us Guessing All Summer Is Beckett going to run for State Senate? If she becomes a captain, will she have to leave the 12th precinct? Is the story of Castle’s disappearance really over? What is this show going to look like with new people running it, and without Miller and Marlowe’s influence? And will it end with a bang (like this would have been) or with a whimper when all is said and done? Finale Grade A. Since my only real issue with this finale was that it set the bar too high for anything that’s going to come after it, I couldn’t give it anything less than high marks. It hit every note with ease and grace, and it reminded me of all the reasons why Castle will never stop holding a piece of my heart. It’s everything I could have asked for in a finale, and it’s an episode I know I will return to again and again when I watch my favorite hours of Castle. Enjoyed your review very much! However I do look forward to season 8 and perhaps more. We certainly have a very talented cast which could carry us far providing the writters live up to their potential. Kate could take over the 12 if Gates gets promoted to a little higher position in the 12th. That keeps the team together including Gates. Then in a following year or so Kate could try for politics and become a senator at the end of whenever the series concludes. Let’s face it there are several avenues open if the writers are good. Thank you! I do agree that if the writing holds up, there are a lot of avenues they can follow. I also think you’re right about Kate running for office at the end of the series. With the show’s run extending, I can’t see it happening right now. I could see her and Gates both moving up professionally so at least she’s able to stay at the 12th in her new role as captain. I agree with how good this episode was. It makes me wish it was the actual series finale too. It would have worked. It would have made an amazing series finale. Here’s hoping whenever the actual series finale happens, it manages to be just as good. I agree with much of what you said here. I also felt that there were some stellar scenes and performances in this episode that will be hard for the show to top. But I don’t regret that it wasn’t the series finale in any way. I was actually feeling a lot of anxiety at the end of this episode that it actually might be the series finale because, even though the show was renewed, at the time we didn’t know for sure whether or not Stana was going to be back. And if she wasn’t coming back, then the show would have effectively been over for me. I was very relieved to see the news the next day that she would definitely be back. I’m glad the show will have the opportunity to try and top itself with an episode even more thrilling and moving than this one. Because even though this episode and a few others this season were really spectacular, there were also other episodes that just haven’t been worthy of the series I’ve come to know and love. (Yes, “Sleeper,” I’m looking at you first and foremost! Those last 7 minutes! Ugh!) And I want the show to have a really great run before it takes a final bow, not a mediocre one. I think this show deserves the chance to do that. So I’m happy it will be back for at least one more season. I want to see it make a straight run to the finish line, not weave and waver just before the end. No one can know what will happen this next season with Andrew and Terri gone, but I’m hoping for the best, because I believe the other writers of this show love it as much as the fans do. And I think they want to make this show the best it can be. I’m really hoping they succeed. I absolutely love the sense of optimism in this comment, and I’m going to channel that into my own views on the next season of Castle and beyond. As someone who’s been burned by many of her favorite shows going on for too long, I get anxious about shows overstaying their welcome, but I like the faith you have that Castle will have plenty more strong episodes. There’s potential for next season to be a very strong one, and I’m looking forward to it more and more with each passing day. I love that Castle inspired you in that way, and this was a perfect finale to remember that inspiration! I loved this episode. I was really surprised that I would have been satisfied if it had ended up being a series finale although I’m glad to have one more season with these characters. This episode was the best farewell episode that Andrew and Terri could possibly have crafted and you could really feel all the love and care they’ve put into the show and its characters. Beckett’s defense of herself was fantastic and I beamed with pride to see how happy Beckett is with her life. She fights for justice and she fights for the victims and that is all that matters. She’s proud to be Castle’s wife and the inspiration for Nikki Heat. She’s proud of the life and family the two of them have built together and she’s fiercely defensive of it and it is all I could have ever wanted for her. She has grown so much and I love that we’ve gotten to see every bit of that growth as it’s happened. I loved that the distinction she made to Castle – they aren’t who they are because of what happened to them. The external circumstances didn’t shape their lives, they did that on their own as they worked to deal with and overcome those circumstances. They are active participants in their lives and I love that that is a theme that was reflected in both Castle and OUaT this season. Finally, there was nothing about that final scene that wasn’t 100% perfect. Seeing all of them there together had me crying before Castle started his speech but then he said those beautiful words and I was a complete mess. This show stars two characters who started the show with very few real attachments and connections in their life and 7 seasons later, they are married and in love and surrounded by a whole group of people who love them both. I love that the precinct was there to watch Castle accept the award and I’ve loved seeing Martha and Alexis embrace Beckett as part of the family. Their lives are richer now because of what the other has brought into their lives. I’m glad we got another “always”, it was the perfect place for it. I am finally getting around to responding to season finales. This one I sat on for a bit because I wanted to watch it again and mull it over. I agree with you that this would have marked a peaceful and wonderful end to the series had it not been renewed, but I actually think it was more fitting end for Marlowe and Miller. It was clear from Andrew Marlowe’s interviews to the episodes he and Teri wrote that this was their story – the story of two people coming together, clearly destined and the uneven, not so direct road that they took to get there. What I appreciated about this finale was that it closed a chapter for Castle. The arc that is Beckett & Castle becoming Caskett. I feel like the center of this series has been about that discovery in all facets. It’s what made their wedding vows and Castle’s final speech work. I was so struck by the opening of that, when he said he didn’t know if he’d ever write again until she walked into his life. It was a perfect parallel to Beckett’s earlier declaration that she was proud not just to be his wife, but his muse. That’s a far cry from the reluctant Beckett who opened the series and the arrogance of Castle. These people intersected and helped each other become their best selves. Through Marlowe’s vision we got to see these two flawed people evolve and it’s been a fantastic ride. So the finale was fitting for the close of this chapter of Marlowe & Miller and for these characters. That leaves us with ‘what’s next’. I like you have my concerns and reservations. But I feel like this is the perfect point for Castle to evolve and become a new show. One with an established set of realities – Caskett being unbreakable, the full depth of this family extending to the 12th and these two people who are ready for a set of unknown challenges. How they will navigate around the procedural and find new ways to be fresh are interesting to me and concerning, because it is easily the place where the show most readily shows its age. That said, I don’t remember a show where I cared more about the entire ensemble as I do for Castle. Each of them is important to the fabric of this show. We see it time and again when you look back on the highlights of this season in particular. They are the reason I continue to watch 7 years later. They are the reasons moments like Last Call’s closing shot stands as one of my favorite moments in the show’s history. I am eager to see how the new team takes that known commodity and builds out a new course for this show and I hope that it is successful. Because while this would have made for a fitting end to bringing a show I love full circle. I would love to see a sunset for Castle’s characters that leave us feeling an eternal sense of “until tomorrow”.